It's been a bit of a hectic year with a lot of travelling with our company. It's brilliant, make no mistake. Travelling around and working on bicycle projects in cities on three continents, meeting politicians and policymakers, giving keynotes to fantastic audiences and attending Cycle Chic events. All wonderful things. All inspiring and humbling things featuring inspiring and visionary people who are likeminded in their passion for liveable cities. Best job in the world. The Very Best Thing in the World, however, awaits me when I get home. Picking up and dropping off my kids at kindergarten and school. That just happens to be by bicycle. 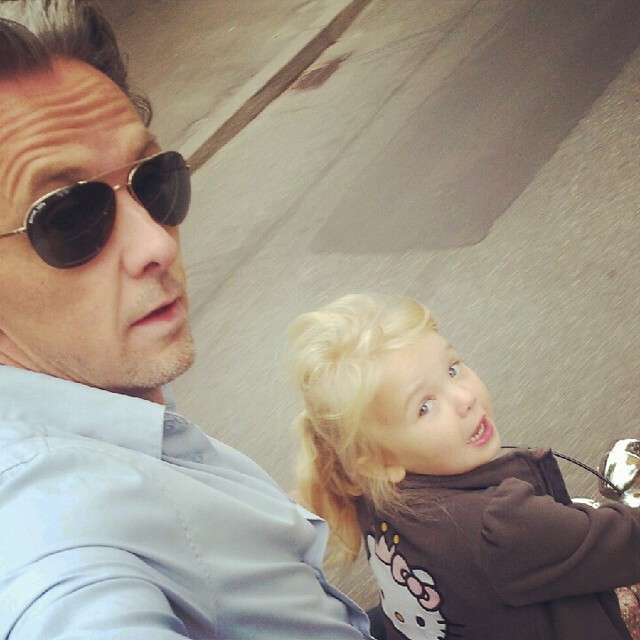 At the moment, Lulu-Sophia sits on my bicycle to kindergarten and Felix uses his scooter. He comes home a bit later so it's more often than not Lulu-Sophia and I. We've gotten into the habit of taking photos. Recording this Very Best Thing in the World for posterity. Bicycles feature prominently in our lives. A car-free urban existence presupposes bicycles and public transport. I've made a conscious decision not to even mention bicycles. I don't bang on about how great they are, how righteous we are because we use them, how we "save the planet" and all that sub-cultural messaging. I don't want my children to be conscious of bicycles. Not just yet. I simply want them to regard the bicycle as a normal part of their lives. Telling them that they are "special" because we ride bicycles risks making them feel like they are unusual. Homo sapiens are conservative creatures. The vast majority don't wish to stand out, not least children. We have detailed garbage sorting facilities in our backyard and we sort our garbage. I don't think I've mentioned about the importance of it, we just do it. They'll get to know why it's important later. But right now, it's just a part of our daily lives. Nothing more. Sure, this is a city where many people ride bicycles, but I still try to avoid verbal messaging. In order to condition them into feeling like bicycles are just as normal as the vacuum cleaner in the closet or taking a train to grandma's house, we simply don't talk about it. Of course, it enters the conversation once in a while. We'll talk about how windy it is and how much nicer it is to cycle when it's not raining. On the weekends we'll go for a bike ride and, upon arriving home, say "that was a nice bike ride." But we could also say, "that was a nice visit to the playground" and not mention our transport mode. With Felix, who is ten years old, there are more and more great discussions about urban planning and transportation than with Lulu-Sophia, who is four. Although Lulu-Sophia is certainly capable of urbanist observations on her own. I visited Felix's school class and spoke to them about liveable cities over several days, together with an anthropologist here at Copenhagenize Consulting, Agnete Suhr. It ended up with their participation in our The Good City exhibition with Bicycle Innovation Lab that we started last year. They retrofitted the roundabout outside their school to make it more bicycle-friendly. Their observations are featured alongside the work of urban planning companies and architecture bureaus. And they might just be the most rational, visionary minds in the exhibition. But for all the thought process behind it, the simplicity remains. I'll hurry from work to the kindergarten with work on the brain but as soon as we're both on the bicycle heading home, it hits me. The Very Best Thing. We'll chat about Lulu's day, look at the things we pass, maybe stop at the supermarket. The simplicity is the beauty of it. And it makes my day every day it happens. Felix, by and large, is independantly mobile. He rides his own bike, although at the moment, scooters are all the rage among him and his friends. Once in a while he'll get a ride on my bike, though. It's not all about bicycles, it's about getting around our 'hood. Bicycles, scooters, walking, skateboarding. All good, liveable city modes of transport. And talking about simplicity, Lulu-Sophia suddenly produced her first bicycle drawing recently. At left. Talk about minimalissimo. A fantastic deconstruction of the bicycle. Although we know bicycles are just damn hard to draw. The drawing in the middle is of our Bullitt cargo bike. More deconstruction. :-) Then she drew herself and her bicycle. Brilliant. The "save the planet"-part and the "a lot of travelling with our company"-part made me wonder, how many grams of CO2 your company have contributed with during the hectic year? Well, check out miss sassy. Absolutely divine. Our company certainly compares favourably with other Danish companies of the same size regarding our carbon footprint. All the fantastic opportunities available in Scandinavian countries for keeping our carbon impact down are at our disposal and we use them readily. Given the nature of our business, we do even more than most. We travel, perhaps, more often but it would be rather difficult to calculate the positive effects of our work in other cities. Getting more people onto bikes by helping cities build bicycle infrastructure and developing communication strategies for promoting cycling. Really beautiful. I feel the same way when I pick up my daughter from daycare or take her to the park. There's a quiet closeness that can't be duplicated on other forms of transportation. Loving images all. I agree w/ your comment that we human prefer not to stand out. I think most of us want to fit in. I know that I do, while also striving not to compromise my values or just good taste. Kids definitely don't want to be perceived as a weirdo. They want friendship and crave wonder and shared experiences. I think bicycles just naturally facilitate that. This is what life is really all about -- the "little daily things we do" that include pedaling. How so many got away from that, in favor of the personal auto (an ANCHOR if there ever was one! ), I will never truly understand...even though I've been there myself. Maybe it's because I knew, even at the time, that I was giving up something GOOD. Amazing post, Mikael! Admittedly, Coralie has heard a lot from me about how great it is to get around by bikes, but then again, she insisted during school that we had to ride every day, even in the rain, because it's saving the planet. I think the combination of our own activism plus a teacher who rides every day and is quite passionate about creating a healthy planet had something to do with that. It's amazing what they pick up from the adults around them, even if we don't intend to be overly passionate. Your kids look like they love the way you get around town, and I think that's what matters most! Love it!